Call us at 1-714-521-0555 or 1-877-521-2655. Private Selection Available October, November, December & New Years Only!! Enroll in our Christmas List / Holiday List Program!! 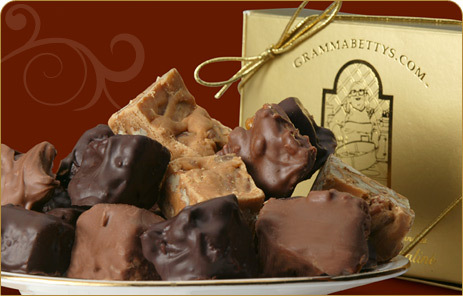 In the early 1940s Gramma Betty began making luxury chocolates using a family recipes which has been passed down for 5 generations. Why become a Gramma Betty's Client? Fresh Quality You Can Taste. Today, the company takes great pride in the chocolate recipes and ships these luxury chocolates coast to coast. Free online Gift List Account. Create an Account to be eligible for our free raffle sweepstakes!